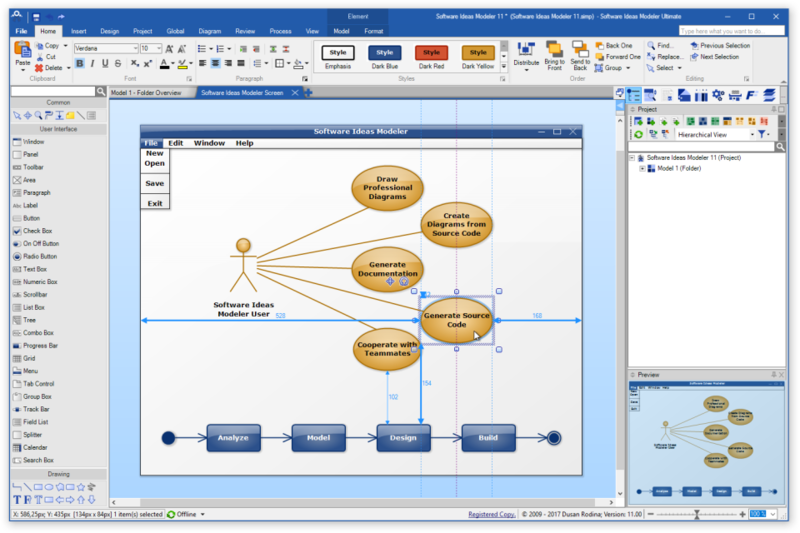 Smart diagramming software for software analysis with UML, SysML, ERD, BPMN, ArchiMate, flowcharts, user stories and wireframe support. Software Ideas Modeler Reviews Recently Reviewed! The Software Ideas Modeler : A Fantastic Tool For Modeling Softwares, Uml Diagramming And More. Pros: The software ideas modeler is a great software that does so many things, out of which include, modeling softwares, Diagramming uml, flow charts, entire relationship diagrams, venn diagrams and many other cool functionalities, the part i use and what i like most is when i want to build a relationship for my database work, this tool makes it extremely easy for me as i can use the entity relationship tool and draw out everything and this makes me see how my coding is suppose to be done, back then when i was not aware of the existence of the software, it would take me days drawing on piece of papers and trying to make relationships for my database which i end up screwing everything up because i don't have any tool to make it easy for me, but now with this software i can do everything within just an hour and start my coding right away, this is no doubt an invaluable tool for software developers and IT professionals. Cons: The only problem with this tool is that most of the functions are not easily visible to someone who just starts using it,it's somehow complex and the learning curve of this software is steep based on my analysis, it took me quite a bit to get use to the software. it will really be appreciated if they can make things easier for users. Overall: Ever since i started using this software it has ease my work in so many aspects, it saves me time, cost and makes everything moving smoothly for me, i really recommend this software to any software developer or IT professional.